The title of your book is unusual. It comes from two different speeches of two prime ministers—Manmohan Singh and Narendra Modi. It struck me that the sentiment captures something about this moment and the fact that you have two prime ministers, from different parties, who don’t see eye-to-eye on a lot of stuff, but share a common sense that there is something happening for India on the world stage. Wouldn’t the title have been more apt for, say, China? That’s what ambassador Shyam Saran (former Indian foreign secretary) said in a review. I understand why someone would say that. But I have written this book also for an American reader who may not know what India has accomplished over the past decade. If you asked Americans to give a list of the world’s five largest economies, I don’t think India would even be mentioned among them. Because people tend to focus on challenges without realizing that those exist side by side with what has been a slow but steady transformation of the way India engages with the world—whether it’s diplomacy, defence or economic issues. A part of the argument I am making is, as Americans, we have to understand and appreciate what the trajectory of this country looks like for the future, adjust our diplomacy and make sure our next generation is better prepared to work with a rising India. What role has the US played in India’s rise? I believe the US to be an important factor in India’s rise. The entire last chapter of my book has recommendations for US foreign policy. Those span the whole range, re-conceptualizing the way we think about our relationship. Very often Americans lapse into imagining we have a good partnership, we are the world’s largest democracy, we should be on a path towards an alliance. I don’t think India wants an alliance. That’s not on the table here. So Americans should just adjust to a different mode. We should think of the US-India relationship as a joint venture, where we will have some areas of deep cooperation. We will also have some areas of disagreement, whether that’s economic friction or the way we think about unfolding events—Russia’s Crimea, for example, or Iran, there is always a difference of opinion on that—and not let those differences infect the areas of positive convergence and cooperation. So where can the US play a helpful, supportive role? India is a bulwark of democracy in a turbulent region. Despite its many problems and challenges, it is still a country that stands for something—democratic values. How can the US help India gain that voice, that seat at the table? I think the US can be particularly helpful in global governance reform—whether it is doing more on UN Security Council reform or looking at some of the economic institutions of governance. This is particularly acute for India at a time when its economy has become one of the world’s largest. I have written quite a bit about India in the Asia Pacific Economic Cooperation (Apec). Why isn’t India in Apec? The US should put its shoulder to the wheel and help India gain membership. The US hasn’t been very supportive of India’s entry into the UN Security Council, for example. Why is that? (Then) president Barack Obama said very specifically—I was working in government then, so I remember what he said—that the US looks forward to Indian membership in a reformed and expanded UN Security Council. I agree it’s without a date and we haven’t seen a deep engagement on the diplomacy required to do that. India in the UN came up with a text-based negotiating process about a year and a half ago and it has not advanced in the way it was hoped. It’s hard to reform these older institutions, but if you look at them now, I completely agree with critics who say it doesn’t represent the way the world looks today. Let me add to that. The George Bush administration worked on the civil nuclear agreement. One desired outcome of it was to see direct US company cooperation with the Nuclear Power Corporation of India Ltd (NPCIL) and being able to build reactors here. People also don’t focus much on another component: The US commitment, carried through by the Obama administration, in supporting India’s entry into the four major non-proliferation regimes. India is now in three of these and there is one left. That’s a sea change from the days the US and India had a one-issue agenda, which was to be at loggerheads over nuclear non-proliferation. What’s the most important challenge facing India today? The most important challenge before India will be finding a way to sustain high rates of economic growth that also provides and generates jobs. That has to be, and is, a high priority, even though successive governments have not been able to deliver on it in the way they had hoped for. But it has to remain the major aim because it underpins India’s ability to carry the global weight, its ability to fund its infrastructure development, defence modernization, and continue as a growing and major development partner for other countries, both in the region and beyond. We can’t allow these challenges to eclipse our ability to recognize whatever else is happening at the same time. I don’t believe India will overcome all its domestic challenges by the time it is a decisively influential major global power. There is a dichotomy in the perception of India. India will be a major power before it has overcome all of its domestic challenges. And we already see that now. So a big piece of what I am arguing is that we should be able to process the rise of a power that doesn’t look like the US. To what extent will terrorism and China be inhibiting factors in India’s rise? As I argue in the book, many like to point to the difficult relations between India and Pakistan and ask if it’s possible for India to rise with such a challenge on its border. I agree it’s a challenge that weighs India down. But India is not limited by the challenge it faces from Pakistan. Rather, it has a much bigger vision for what it wants to accomplish and how it would like to go about doing that. I think Pakistan will continue to be a challenge for India but I don’t think it prevents India from rising. I agree with the enormous challenge China poses for India and I think that has actually spurred India to think much more about its own strategies. You hear Indian leaders talk about the Indo-Pacific region, you hear Indian prime ministers being vocal about the freedom of navigation and rule of law, and what that means. India wants to stand up and be counted as a defender of this world order. I think that is very significant. I see an Indian government that is looking to see what its response could be to the Belt and Road Initiative, to the development of infrastructure that China is leading with countries in the region. China now has a military base in Djibouti. In 2015, India announced it would be building a base in Seychelles. That’s the first time ever India has done something like it. It’s a big change. Can China prevent India’s rise? I think it can’t. India has the ability to control what it decides to do—issues it stands up for, the stances it takes, where it pushes its muscle on the world stage. So those are all factors the country is in control of. Factors that India is not in control of, but can do more to try and enhance, are economic management, continued reforms to get a sustained high level of economic growth, and investment in infrastructure. 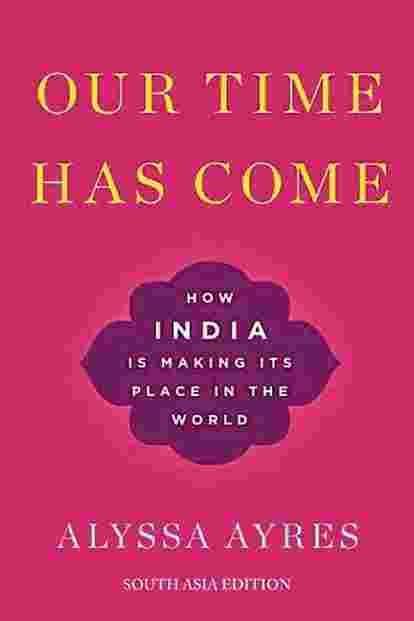 Our Time Has Come—How India Is Making Its Place In The World: By Alyssa Ayres, Oxford University Press, 360 pages, Rs695.